You seem to have a few things to say for yourself about family matters. Do you have any tips for a completely (ahem) imaginary situation in which you find a little bit of tension appearing in your relationship with your wife? Perhaps you’ve felt over a recent holiday season that she’s been a little bit shorter with you than normal, a little less patient. Any advice very welcome. One: Be Open About Your Feelings. Let’s deal with this one straight away. You’d probably expect me to say this. But no. As far as I’m concerned, it’s much better to skulk round the subject for a few days. In this way, your good lady can pick up on the fact that something’s not quite right, misinterpret it, and then become more negative in her own behaviour. Happy days. You really don’t want to be spending time together on your own when there’s any tension between you. You’re far better off putting all your efforts into keeping other people happy – your parents, your children, your whole wider family in fact. You’ll find this helps a lot, particularly if your minor marital misunderstandings coincide with a nice relaxing time of the year like Christmas. Three: Make Some Me Time. It’s easy to fall into the trap of spending all your time thinking about others. Don’t. You need space. Space to connect with your inner child. Space to indulge in a little honest-to-god, cathartic self-pity. Because you’re worth it. Timing is everything. You may need to be patient. Wait for that special moment to bring things to a head. 2.00 a.m on New Years Day when you’ve spent the last seven hours feeding, watering and entertaining six other families, for instance. Even better if you add that little dash of something else – several glasses of red wine too many, perhaps. Five: Get Her In The Right Mood By Being Nice About Her Friends. A woman always appreciates it when you reaffirm her friendship choices. Be as positive as you can. Something like, “I thought Julia looked really good tonight. Don’t think I’ve ever seen her looking hotter, to be honest. And Emma – wow!” A tip for the advanced student here – it’s even better if she doesn’t really like Emma. It takes a special kind of husband to show that kind of consideration. Six: Choose Your Words With Care. When the time comes, don’t open up with something pathetic like: “I’ve been a bit worried that you may be finding me boring or irritating, and I think we should talk about it.” Take a bolder line. Suggest that she’s not been paying you enough attention. It’s bound to get things off to a good start. Our fears are never very far away. And my biggest fear with being alongside my wife as she goes through the profound experience of becoming a psychotherapist is that she may one day outgrow me, outgrow us. Over Christmas this bubbled to the surface. Nothing major. Just a nagging feeling that she was finding me tiresome. And that this was a cause for concern. It’s quite a demanding time of year for us – lots of other people to keep happy – and not one she particularly enjoys. And maybe she does move a little too quickly to putting on an air of martyrdom. 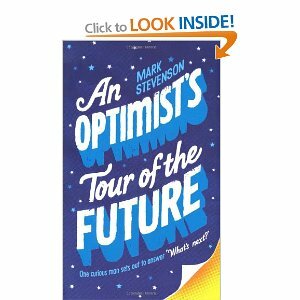 One thing I did over Christmas was finish reading this very uplifting book. It deliberately looks at what good news there may be for us all in some very rapid changes in technology going on at the moment. And, if it’s all to be believed, there is potentially a lot of good news. Stevenson talks about things that most of us probably don’t know or hear much about – micro-technology, genetics, robotics etc. There’s understandably a lot about climate change and energy policy, and suggestions that there may be answers to both well within our grasp. He also argues that we could in our lifetimes see the western capitalist model replaced with something new. It all sounds a bit heavy, but it’s not. This is one of those books about science that non-scientists can easily follow. And quite funny in places as well. For all the discussion of science and technology, one of the most interesting sections is where he describes how something as simple as putting fences in different places can completely transform the drought-scarred Australian outback. Although equally interesting is the fact that many Australian farmers are resisting the new ideas because it’s not how their fathers farmed. 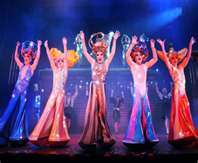 A little easier on the intellect, but equally uplifting, was the family trip to see Priscilla, Queen of the Desert. Not one for the homophobe or anyone with a Victorian attitude to all things naughty, but in our collective opinion, utterly, utterly brilliant. In the best traditions of theatre, it will make most people laugh and cry. On top of everything else, I get a real buzz out of seeing almost anything done to a very, very high standard, and this was world class. Not everything about Christmas was this good, but these things, and the extraordinary behaviour of the Very Precious Daughter, have left my pointlessly optimistic nature in good shape. And we’re going to the panto this afternoon – for me always one of the holiday highlights. I need to cling onto this warm, fuzzy feeling. Sometimes they glitter, my people here. Sometimes, they shine. I’m not sure my children understand the pressure I’m under here. I want to keep this blog going. I’m really enjoying writing it. But I need material, and I rely on them to provide it. The Very Precious Daughter (VPD), in particular, is supposed to be an endless source of tales of frustration, heart-ache, worry and financial ruin. And when it turned out that she would be with us for at least two weeks over Christmas – and when those two weeks started with her getting into a horrible situation when drunk, and then (in an unrelated incident) having her phone cut off because she hadn’t paid the bill – it was all looking so promising. But she’s let me down. Ever since she arrived home she has been an absolute angel. She’s been engaging, thoughtful and kind. She bought everyone a present without a visit to the Bank of Dad. We’ve watched films together, made cocktails, and we’ve talked. She’s kept her room tidy, and she’s visibly pulled back more than once when all the signs were that the volcano of her emotions was about to explode. I’m at my wits end – I really don’t know what I’m going to do if this carries on. It’s also rubbed off on the others. We went out for a curry last week and as I walked home behind my children, I felt a sense of pride that made me feel like I was going to burst. But at least I’m not alone in having to cope with this. My oldest and dearest friend also has a daughter of about the same age, who has put her parents through much the same kind of grief as the VPD (although I think she’s chosen drugs as her main theme). I only see my friend at this time of year, because he lives abroad. But he’s had a similar experience – his daughter has calmed down significantly as well. One of the most difficult aspects of this being a parent thing is that nobody ever tells you what’s coming next. P.S. 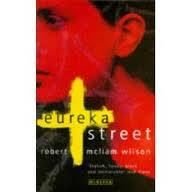 The title is a (slight mis-) quote from Eureka Street by Robert McLiam Wilson. One of the very best novels of the last twenty years, in my very humble opinion. If you want to laugh till you ache, and be moved till you weep, I would thoroughly recommend it. Whatever view you might take on the wider implications of what David Cameron did with the veto in Brussels (and I have to say, I keep changing my mind), one thing’s for certain – he didn’t give much thought to the effect it would have on Christmas at our house. She likes nothing more than hectoring, bullying and brow-beating anyone in hearing range into forcibly accepting her very lopsided view of the world a nice chat about politics. She can go on for hours and hours and hours, and then some. She cannot resist any opportunity to put the boot into the country where she lived for thirty years, where her children were born and which continues to pay her a pension UK even though she left for foreign climes about twenty years ago. She is coming for Christmas. Like a photograph dissolving slowly into a Powerpoint slide, these factors will in all likelihood achieve a perfect clarity just after we have fed her on Christmas day. All round the country families will be settling down to watch a nice film, or pouring another drink and reminiscing on the year that’s been, or gathering round a crackling log fire to play parlour games. It will be very different for me and The Beautiful Armenian (who despite her heritage is now English rose through and through). The mother-in-law will just be getting into her stride, holding us personally responsible not just for Mr Cameron’s actions, but also for the economic melt-down which is bound to follow, for the extreme poverty this will inflict on her (yeah, right), for the fact that you can’t get proper coffee in England, for the English divorce system failing to award her millions of pounds for slightly hurt feelings, for the poor quality of English pub food in the 1970’s, and so on. Thanks for that, Prime Minister. We’ve already had a couple of e-mails warming us up on the subject. Now the golden rule in these monotonous diatribes conversations is never, ever, to get drawn in. Listen carefully enough to deploy tactical nodding and shaking of the head. Frown or smile occasionally. But say nothing. You can’t win. It’s taken more than three decades for me to work this out. Even agreement leads to trouble, or at least to her finding a second wind. She may think I’m a grinning idiot with nothing between my ears, but I can live with that if it shortens the pain. But it’s high risk. We could just end up having to go two rounds.